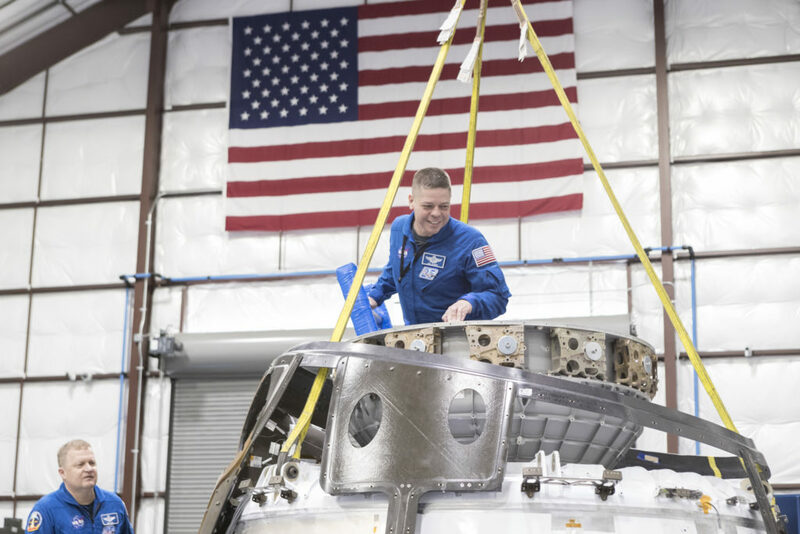 Bob Behnken and Eric Boe, two of NASA’s four veteran astronauts who supported SpaceX as it refines its crew transportation system designs, checked out the Crew Dragon being used for qualification testing. 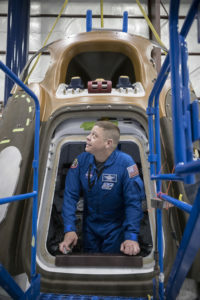 NASA astronauts routinely travel to industry facilities during spacecraft and mission development to train and offer insights to engineers. As seen here, Behken is evaluating the Crew Dragon’s hatches. The top hatch, at the nose of the spacecraft, will be the connecting port at the International Space Station. The side hatch will be the entryway for crews getting into the spacecraft when on Earth. The Crew Dragon spacecraft and related test vehicles are being manufactured at SpaceX’s headquarters and factory in Hawthorne, California. The Crew Dragon is being built to routinely fly four astronauts to the International Space Station although it can carry up to seven people. Flight tests, first without a crew then with astronauts aboard, will take place before operational crew rotation missions. NASA also partnered with Boeing to build and operate a separate, independent space system called the CST-100 Starliner to carry astronauts to the station. Both vehicles are being developed in close coordination with NASA’s Commercial Crew Program. Photos by SpaceX.